Small booklet by Anne Campbell, Lewis, listing the Gaelic names and terms for features of Lewis moorlands and for working there (mostly peat-cutting). Photograph of ruined jetties in Fisgary Bay, Coll, in 2012. Three lumps of peat collected from the bank of Amhainn Bhan, Balevullin, in 2012. Only a small amount of peat was ever present on Tiree, and all the useful cuttings were exhausted decades ago. These pieces are very rare examples. Head of a rutting or ritting spade designed for cutting turves for roofing or for digging ditches. Shovel-shaped with long flat spike out to one side. Found in the garden of Lonsdale Cottage, Heanish. Newspaper article about the sinking of a boat carrying 26 people from Tiree in 1828. Extract from a letter from a man on Coll to a man in Glasgow dated 31st May 1828, published in the Glasgow Herald and extracted by The Times. On the 29th of May 1828 a boat carrying 26 people from Tiree struck rocks near the Treshnish Isles after a peat-cutting expedition to Mull. Twenty-one died. They were Hector John Cameron and his sister Mary Cameron, Charles MacLean, Mary MacDonald, Jean Campbell, Mary Carlisle, William MacLean and his wife, Donald MacLean and his sister Mary MacLean, Catherine Galbraith and her brother Malcolm MacInnes, Alexander Rainey, Alexander Cameron, Neil MacDonald and his daughter. 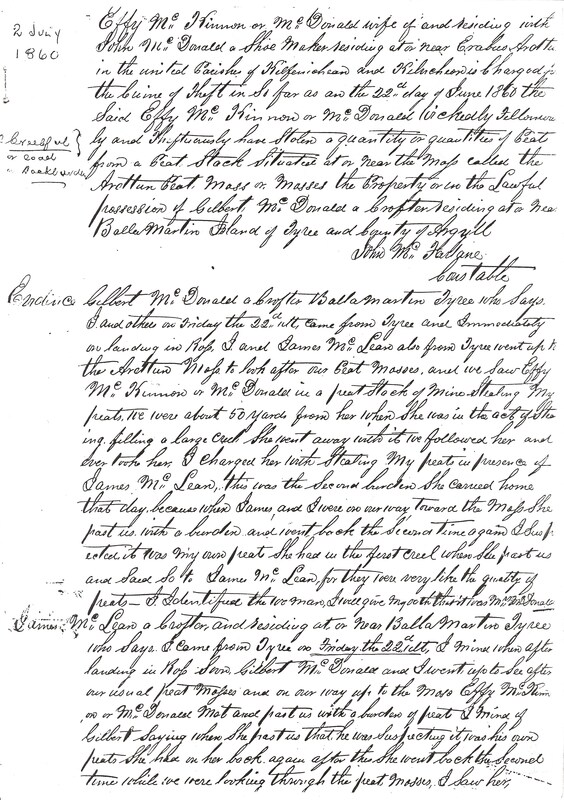 Transcription of a police report on the theft of peats from the Tiree peat moss in the Ross of Mull in 1860. 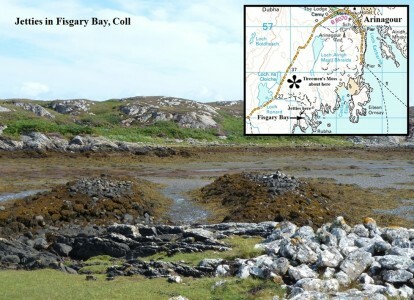 In the previous century the people of Tiree had frequently resorted to the peat mosses in the Ross of Mull for their fuel, a practice that continued, some say, until the beginning of the 20th century. The men and boys would sail over to the Ross in the spring to cut and stack the peats, returning later in the year to ferry the dried peats back to Tiree. 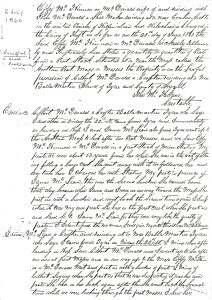 In 1860 Effy MacKinnon of Ardtun appeared before Sheriff Robertson in Tobermory charged with stealing peats belonging to Gilbert MacDonald of Balemartine. She was found guilty and sentenced to six days imprisonment.